Editor’s Note: George Hamlin fills in for Don Phillips this month. —S.B. While we await the return of Don Phillips, it occurred to me that it might be useful to take a look back at Washington, D.C., from a railroad (and railfan) perspective, just before the era of Penn Central and the massive regulatory changes that would follow its collapse. Traditionally, the nation’s capital city was the eastern regional gateway between the North and South, a role fulfilled in the Midwest by Cincinnati, and to a lesser extent, St. Louis. From the north, the “Mother of Railroads” Baltimore & Ohio, along with the Pennsylvania, transferred both freight and passenger traffic via the city’s “Long Bridge” over the Potomac River to the Richmond, Fredericksburg & Potomac, which in turn handed trains off to the Atlantic Coast Line and Seaboard Air Line at Richmond, Va. Although its own trackage didn’t begin until Alexandria, Va., the aptly-named Southern Railway was a strong player in the D.C. area for both freight and passenger service. 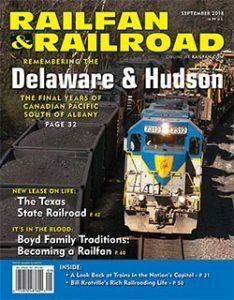 In addition, via trackage rights on the Southern’s Atlanta-Washington main line north of Orange, Va., B&O’s partner Chesapeake & Ohio also made its mark on the area. During this time, I passed through Washington’s Union Station a number of times on my way between home in the New York City area and college in Virginia’s Shenandoah Valley, giving me at least a modest introduction to rail facilities and operations in the vicinity of the capital. For that matter, I’d passed through before on family trips south, including a memorable experience in the summer of 1964 when I walked out to the back side of the Marriott Twin Bridges motel (which was next to the RF&P just south of the bridge) to witness the West Coast Champion behind an ACL E6 passing a northbound B&O freight being led by a “sunburst” paint scheme GP30. Back then, Potomac Yard was the major freight classification facility that handled interchange at this regional boundary. This was the south end of the Pennsy’s electrified trackage in the northeast. I can recall on one trip home dropping a fellow student off at National Airport and looking across at the cluster of GG1s at the PRR facility in what is now Crystal City. Unfortunately, my only views of “Pot Yard” were from the trains I was riding as we rolled past, but this clearly was a big-time rail facility with an abundance of different railroads’ power to be seen. To the north, most of my exposure to D.C. railroading was at Union Station. Sharing a ride by car back from school, I once prevailed upon my friend to pause at Ivy City, which was the large locomotive facility for passenger locomotives serving Union Station. I’d seen published photos of this location, including some taken by well-known photographer Jim Shaughnessy at night; it looked fascinating. By the 1960s what had been Southern green was now black, as were the ACL E-units that came this far north. 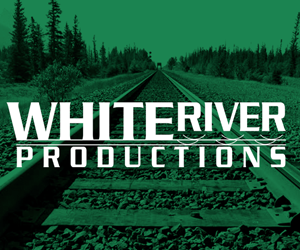 The RF&P still utilized blue and gray, but with a simplified design compared with the past. The C&O, at least for the moment, was still fielding its tri-colored blue-gray-yellow Es, although most B&O units were already in some variation of solid dark blue. But the stars of the Ivy City show were still the Pennsy Gs. Wearing a single broad stripe with a large keystone logo on the flanks, they already looked impressive. The abundance on view at a single location simply multiplied the prestige by a factor of ten. They were not at all hard to like, and I looked forward to seeing them at Ivy City both when arriving and after departing Union Station on my trips to and from New York City. The only surprise to me was the appearance of a pair of B&O RDCs assigned to local commuter service. Since I usually traveled through Washington at Thanksgiving, Christmas, and spring breaks at school, Union Station generally was quite busy when I was passing through. This was especially true in November, when most people traveled on the day before Thanksgiving, and the Sunday after. Among other things, this produced long consists to admire while waiting for the southbound C&O George Washington’s departure. 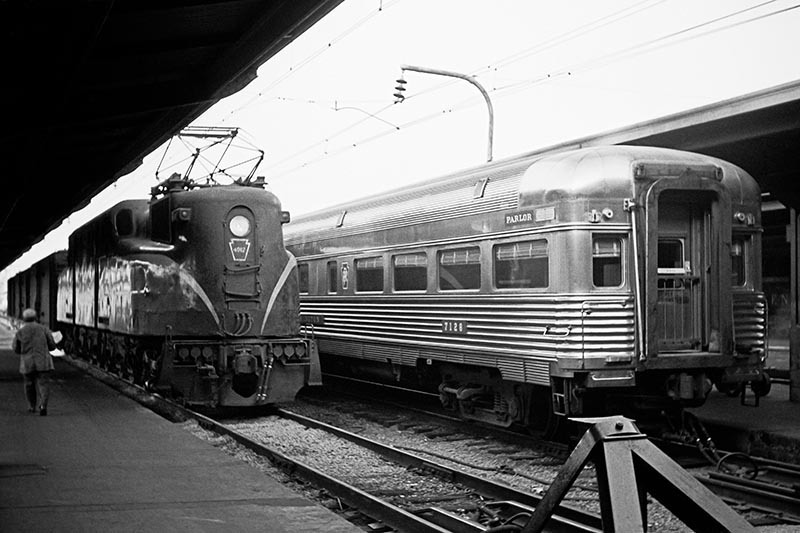 In November 1966, for example, B&O’s westbound Capitol Limited had 15 passenger cars, including the baggage-dormitory-lounge Silver Spring, dome coach 5550 and coach 5505 (formerly named McKeesport) from the postwar all-coach Columbian, as well as eight sleepers, including the five bedroom observation Dana, Slumbercoach Dreamland, and twin-unit diner set 1094 and 1095. Additional color in the consist was provided by C&O Pullman-Standard coach 1649, as well as the Pennsylvania’s five-bedroom, 12-duplex room Crane Creek in Tuscan red. Otherwise, the PRR was much in evidence on the upper level of the station, in particular the departing Afternoon Congressional; on one occasion, I barely made its departure by scrambling aboard the last parlor (on Saturday, there was no parlor observation) as the 16-car train headed north; yes, I did pay the “penalty” (which I think was a dime) for not having purchased my ticket in the station. 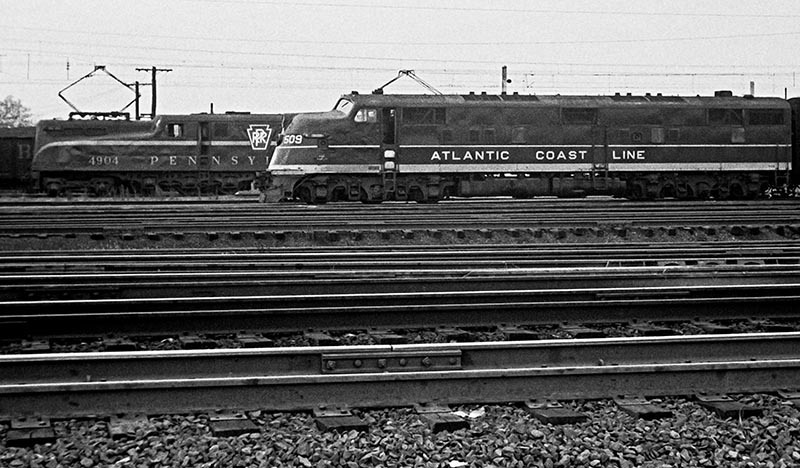 New Haven through equipment was increasingly present, even though the Penn Central merger was still a few years in the future. My first trip north, on the Pennsy’s 6:00pm departure (the Mount Vernon, which included a heavyweight diner and parlor) was in a New Haven 8600 series Pullman-Standard coach, although my ride typically was in a PRR “roomette” coach, rebuilt from Budd sleepers. And yes, there were GG1s to be seen here, as well. On southbound trips, I usually left D.C. on the C&O’s George Washington, which departed from the lower level where photography was more difficult. The Southern’s Birmingham Special typically departed from the track on the other side of the platform about 15 minutes prior to the George; thus, it was useful to descend with the crowd for Southern Train 17, and have a better chance at a good seat on C&O Train 1. And on one of my college-era trips I actually rode through Union Station on the way from New York to Richmond, onboard the Silver Meteor. Even though most of the trip was operated by the Penn Central, the equipment ran through and was still pretty classic, including the unique ex-Seaboard Sun Lounge and right down to the round-end tavern-observation on the rear, all of which made for a very nice afternoon ride down the corridor. In the years since, there have been many changes to the railroad scene around our nation’s capital. Pot Yard is gone, entirely. Freight traffic has found new routes to serve new markets away from the Northeast Corridor. State-funded commuter trains from Maryland and Virginia, at least on weekdays, are now a fair proportion of the traffic, intermingled with Amtrak long-distance and regional trains. The only constant is change… But those are stories for another time.